I know a lot of people think I'm dumb. Well, at least I ain't no educated fool. In Greek mythology, a Sphinx (a winged creature with a lion's body and a women's torso) sat outside of Thebes and asked a riddle of anyone stupid enough to pass by and stop. If the person failed to solve the riddle, then the Sphinx killed and ate them. But if the traveler answered the riddle correctly, then the Sphinx, a bit of a prima donna, would destroy herself. Until the Sphinx met Oedipus, this wasn't a problem. If you aren't familiar with Greek myths or psychological syndromes, Oedipus was the son of the King of Thebes. The king was told by an oracle (the ancient Greek version of Psychic Hot line) that he would be killed by his own son who would then marry his mother. The king was obviously kind of bummed by this revelation and ordered a servant to pierce his son's ankles and leave him to die on a lonely mountain. A shepherd found the boy and took him to the King of Corinth. The queen didn't have any children of her own and believed the gods had sent this one. She named the boy Oedipus (which is Greek for swollen foot...I'm not making this up). They never told Oedipus that he was adopted or that his name meant, "swollen foot." As fate would have it, another oracle told Oedipus that he would kill his own father and marry his mother. Oedipus loved his parents (but not in that way). So he left Corinth rather than risk having the prediction come true. On the road he ran into his real father, the king of Thebes. The king was rude to Oedipus and the two ended up fighting. Oedipus killed him. Personally, I think the guy had it coming. Oedipus proceeds to Thebes, runs into the Sphinx who asks him her riddle: What goes on four legs in the morning, on two legs at noon and on three legs in the evening? Oedipus thinks and says, "Uh...a man?" The Sphinx replies, "No...er...well, yes." Then she falls off the wall and dies. Most of the people in Thebes were relieved. The Sphinx was kind of putting a damper on the tourist trade. Oedipus was treated as a hero and taken to the palace where he meets the widow of the Thebian king (his mother). She hasn't seen her husband in a year and seduces Oedipus. They marry. Eventually they find out that the oracle's prediction has come true. Oedipus' mother hangs herself and Oedipus plucks his eyes out (personally I think he should have plucked something else off, if you catch my drift). The lesson here, other than not killing your father and marrying your mother is not to mess with karma and solve any Sphinx's riddle. If you do, you could end up like Oedipus or Leon Spinks. 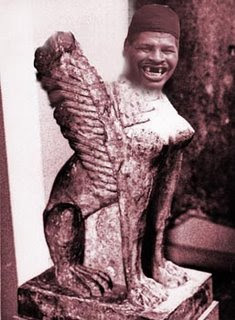 Okay, and just for the record, Leon Spinks technically has nothing to do with the Sphinx of Thebes. 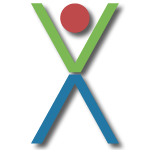 Some people may think so since his last name sounds like "Sphinx," but is spelled, "Spinks." Spinks was the Heavyweight Champion of the World back in the late 70s. He beat Muhammad Ali in a historic fight in Las Vegas in 1978 to gain the crown. Muhammad Ali was kind of old at this point and a boxing legend, so it was kind of like symbolically killing your father. But he made up for it by fighting Ali again in September of that year and losing the title. After getting the crap beat out of him for several years, Spinks went on to make his living signing authographs at major autograph signing shows throughout the United States. Ironically it is said that if you approach him on the street, he will sign an autograph for free. There is a lesson somewhere here, but I just can't put my finger on it. But if someone ever does say to you, "A sphincter says, what?" Don't respond, "What?" Leon Spinks. I had forgotten about him. I had no idea he was Egyptian. Lights, "I had forgotten about him" is a phrase I'm sure Leon Spinks hears quite often. 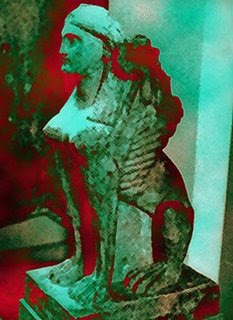 And, my geographically impaired friend, the Sphinx of this Greek myth was from, coincidently enough, Greece, not Egypt. So you really had no idea that Leon Spinks was Greek, not Egyptian. In reality he was from St. Louis, so the riddle thickens.